Syndus is a Bosmer fletcher who operates a shop at The Ragged Flagon. 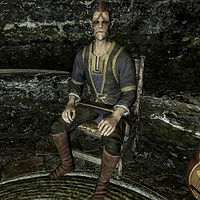 He will move into The Ratway after you complete one of the Thieves Guild's "special" jobs for Delvin Mallory. His shop contains various pieces of archery equipment, most notably a bow that can be found on the counter. Syndus will spend all his time serving his shop while seated on a chair. The only time he will not barter with you is if you have offended the Thieves Guild in some way. He will not offer his services until you have made reparations to the Thieves Guild. Syndus wears a set of merchant's clothes along with a pair of boots. He carries a leveled bow, which can be up to Elven in quality, along with twelve leveled arrows of the best possible quality and a small amount of gold. Syndus thinks quite highly of himself along with his wares and may greet you with, "If you're in the market for the finest bows money can buy, you're talking to the right person." He will continue on: "I've got all sorts of weapons for the discerning marksman. What can I get you?" He seems to be somewhat tired of being so skillful and may mutter, "Skilled, lethal and good-looking. Yep, it's a curse." If you have offended the guild, he will only angrily remark, "I'm surprised you're even showing your face around here after what you did." This is the merchandise found in Syndus' Merchant Chest. These items are only available if purchased from the merchant; they cannot be pickpocketed or stolen. They are restocked every two days. Esta página foi modificada pela última vez à(s) 15h13min de 10 de junho de 2013.